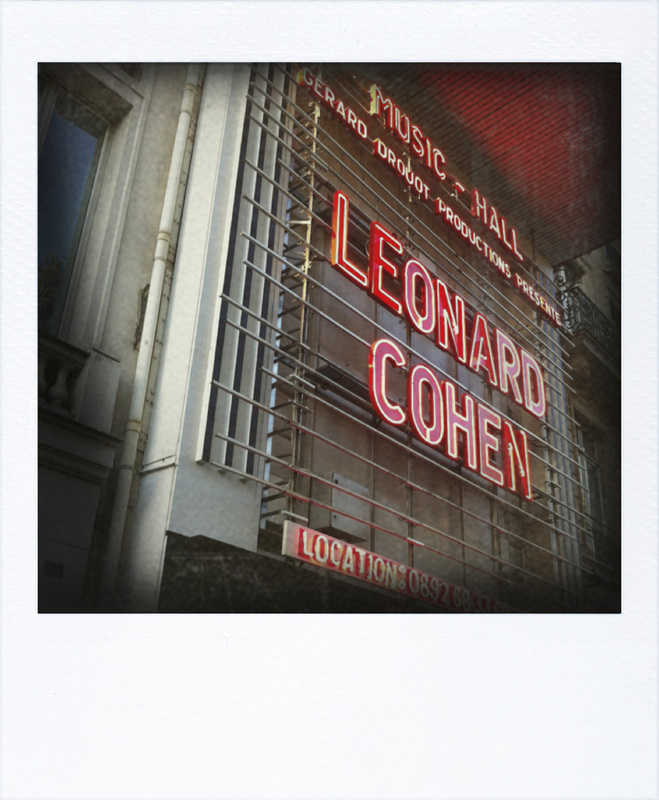 …we took the Eurostar to Paris, to see Leonard Cohen at the Olympia Theatre. It seemed the right place to see him, what with it being the home of French chanson and a far better bet than the O2 as a place to enjoy music. I wrote a fivethings about it, which sums up a lot of what I loved about him and his work. 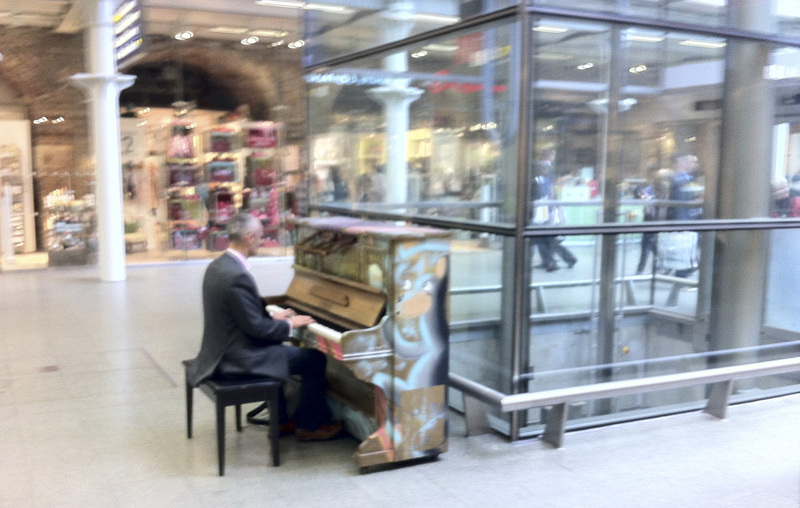 In some kind of omen, as we walk through the train terminal, a man sits and starts playing a lovely, stately version of Len’s now-most-famous-song. As he finishes we say thanks for starting our trip off in such perfect style. He advises us to buy a lottery ticket. 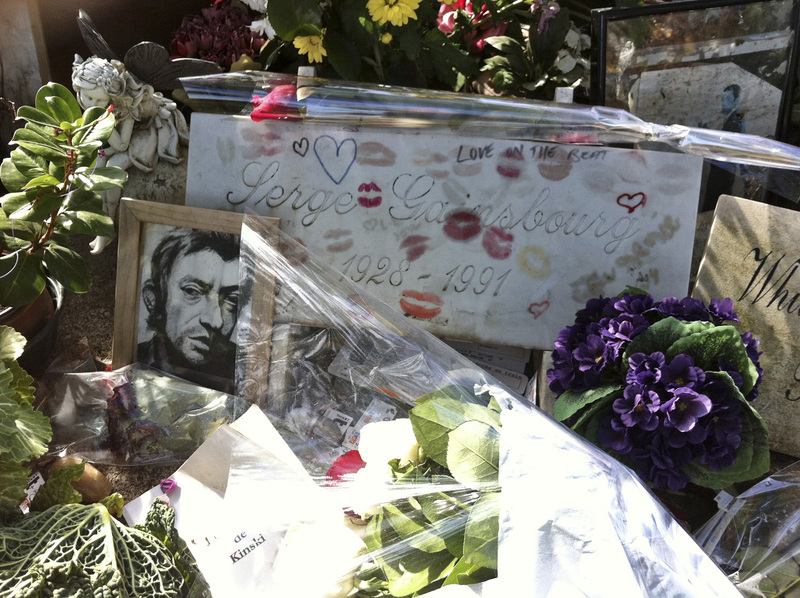 A small detour to the tombs of Man Ray, de Beauvoir and Sartre, and here, covered in metro tokens, roses, kisses and poor pencil drawings, the grave of Serge Gainsbourg. 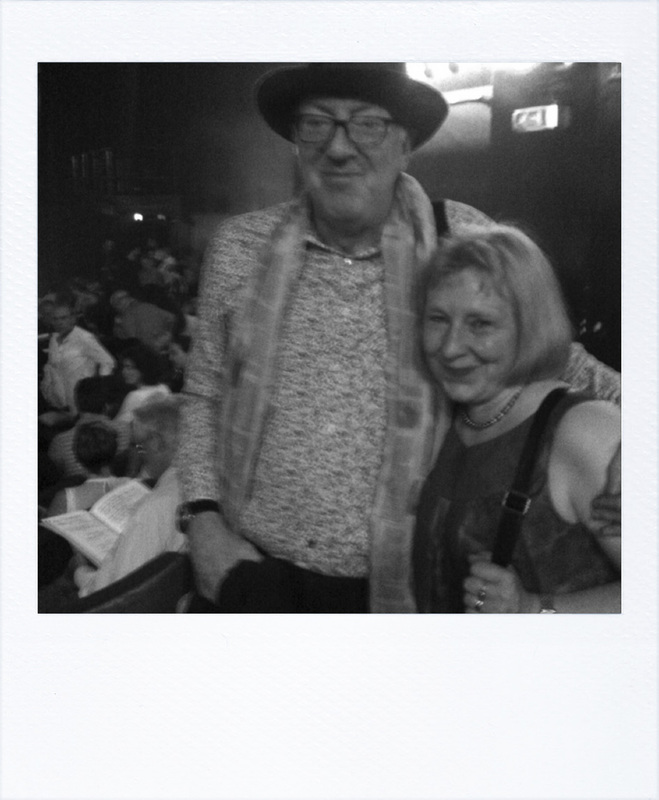 The couple sitting next to us met at a Cohen concert at Leeds University on his first tour in May 1970. And here they were, celebrating at the Paris Olympia 42 years later. Amazing. And my bad photography has cropped the grey fedora—adopted, I was assured, long before Len. 3 encores comprising seven songs. 9 musicians, made up of three women and six men—two singers from Kent, England, one from Los Angeles, USA, one from Montreal, Canada; one drummer from Mexico City, Mexico; one keyboardist from Florida, USA; one guitarist from Texas, USA; one bassist from New York State, USA; one violinist from Moldova; one multi-instrumental string player from Zaragoza, Spain. 1 A brilliant performance of Everybody Knows, every verse a work of genius, every verse a still-accurate assessment of human weakness and failure. Co-written with Sharon Robinson, who later sings a glorious solo version of Alexandra Leaving. 3 Leonard soloing on a Jew’s Harp, that most American of instruments on the hoedown breaks of Closing Time, one of two songs (Heart With No Companion being the other) where he sounds uncannily like Tom T. Hall, only deeper. Also, Take This Waltz in a Weimar-ish arrangement, has a hint of The Sensational Alex Harvey Band. Honest. 4 Night Comes On. I hadn’t dared to hope that I’d hear Leonard sing my favourite song. And sing it he does, causing some spontaneous tears in the audience, its mournful and beautiful melody letting the words cascade in their stoic and weary way, on the cushion of warmth the band create. You have to make your peace with the fact that a certain amount of drama is missed by muting the drums quite this much. The sound is perfect and balanced, intentionally allowing every word to ring clearly through. To make up for the lack of beat, Larson’s churchy Hammond B3, Alex Bublitchi’s muscular violin and Javier’s Mas’s extraordinary Laud provide thrilling dynamics. Mitch Watkins on guitar (after eleven years in Lyle Lovett’s Large Band) provides structure, architecture and blues—his moaning slur at the end of a Wes Montgomery-like solo on Amen the coup de grâce. The older-type singer (the ones who aren’t Mick Jagger, anyway) are very fond of the prizefighter pose. Len takes this even further than the bob-and-weave and sings at least half the set on his knees on the patterned rugs that cover the stage, James Brown-style. It also emphasised the supplicant nature of many of the songs: to God, to Poetry, to lust, love, the musicians and to the audience, who he always addresses as “Friends.” His ability to get back up from his knees with grace is very impressive. The only singer with a deeper voice than Len is Barry White. Fact. Was on the south coast of England in 1976. 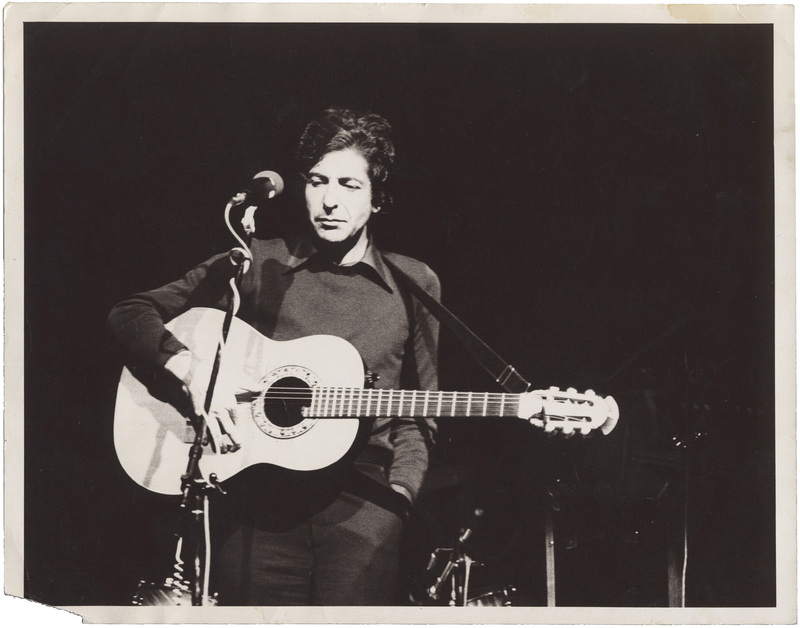 A friend of my mother’s was managing the hotel where Leonard and his musicians were staying and had tickets. I didn’t really know much about his music then—but this was World Music before it had a name, with the flamenco melodies, the gypsy violin and the Moorish oud. Backstage for a meet and greet, we were struck dumb. He was charming. The next morning, having breakfast at the table next to his, we were even more tongue-tied. « Extra. One Thing. Tuesday, November 8th.